If you have been reading my blog, you know that I have built a number of tDCS devices – from the simple to the complex. All do basically the same thing – deliver a very low current for the purpose of various tDCS treatments. I mentioned in my last post that Keith Spaulding of http://dcstim.blogspot.com has come up with what must be the simple tDCS design of the decade. It works, too! Keith plans to market a line of tDCS devices and I’ll review his first in my next post. I decided to borrow Keith’s design one more time and build a simple tDCS device into an old pill bottle, just to show how easy it is to build a current regulated tDCS device – and to show how small they can be. My latest creation could easily be carried in a pocket or tucked in a hat. I call it “tDCS in a Bottle” and yes – I decided to copyright the name – hey why not? 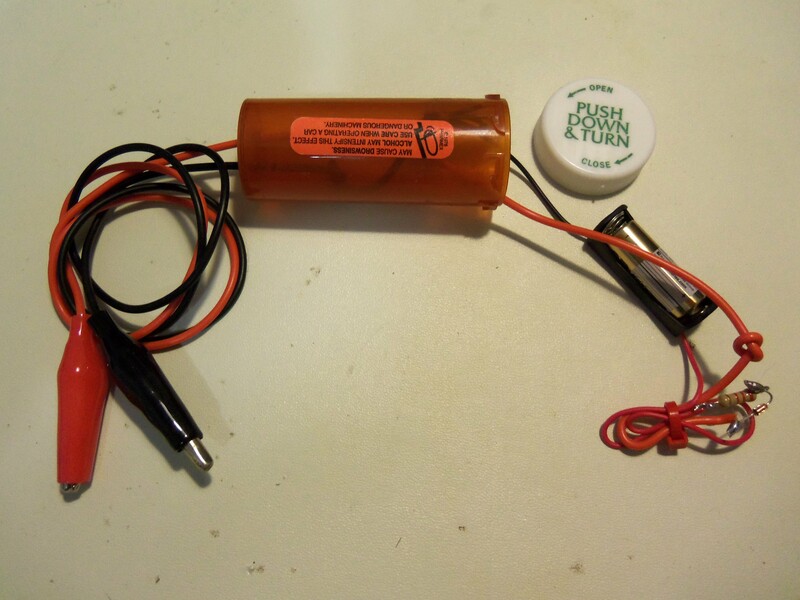 My simple circuit consists of a type 23A 12v volt battery, a 2.2 k Ohm resistor, a current regulating diode (CRD), a pill bottle, and some lead wires. You could build one yourself in 15 minutes or less! After I completed construction, I checked regulated current output with a DVM – and plan to do so periodically to verify battery condition. It’s sort of an ironic twist to build a tDCS device into a pill bottle – just think how many people might be able to get off of pills if tDCS were in wide use by the medical community! Wow! Anyway – “tDCS in a Bottle” works and works well – delivering a current regulated 1, 1.5, or 2 mA depending on which CRD is used. Disclaimer: As always, your use of any information posted here is at your risk. Where do you get your 25A batteries? I can find 23A or 27A, but not 25A. Amazon is a good source. Yeah, even on Amazon I can’t find 25A or A25. Or on batterydepot. Or on the Wikipedia page listing battery sizes. Call me dumb, but I can’t find it. I did find a 9V GP25A, but not a 12V. I’m sorry – I don’t know what I was thinking – it’s a type 23A NOT 25A. I’ve corrected the error in the post. Thank you for pointing out my error. I think your idea of helping people gain the benefits of tDCS is laudable. However, getting the FDA’s approval to sell this at wal-mart (or anywhere else for that matter) is virtually out of the question. The only way is to use a “work around” or a loop hole that doesnt involve getting FDA consent.